The first thing you probably notice is that DWTS is the number two show for the week – a pretty fine accomplishment! But what did we hear all over the media? “Oooo…DWTS ratings are down 30 percent from last spring, OMG! !” Well, yeah, they are down…but so is everything else, obviously. Reality check – some publications just mention the huge dip in ratings with no context. 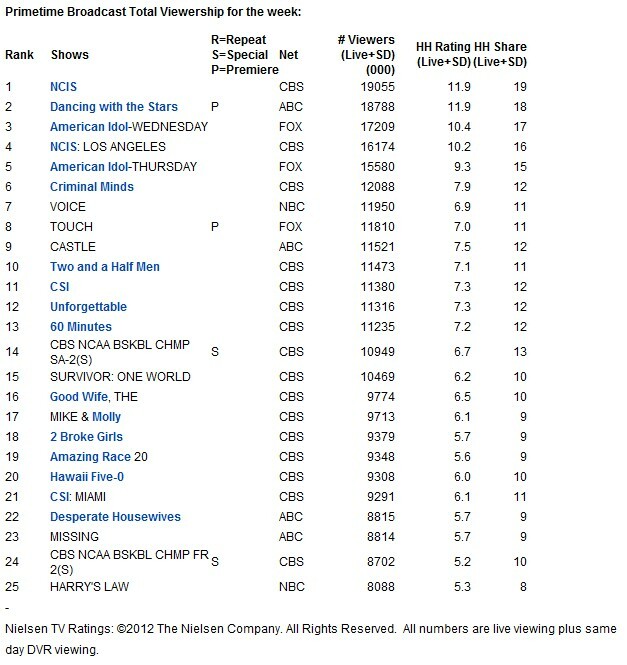 How many of them said, “yeah, the ratings are down but it’s still the number two show in the country for the week?” Not very many. Then we also have people say… some even on this site…Oh, well DWTS always gets beaten in the key demo. Also true…but if you go to Zap2It, you’ll see that DWTS is ranked number 6 for the week in the key demo. Not too shabby. 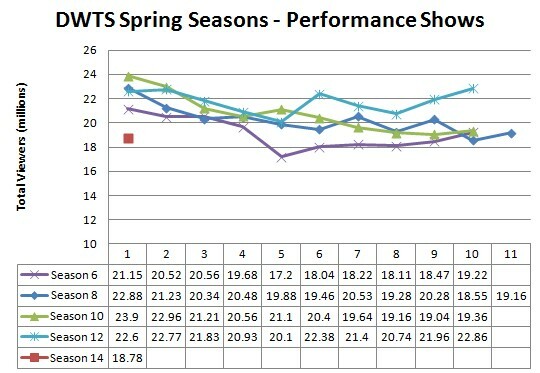 Here’s a graph showing how this season compares in weekly viewers to the other spring season (up to season 6) – you’ll note that it is indeed down from other premieres, but still in line with the numbers for later in those seasons. We’ll have to wait and see how this season pans out. If this season follows the pattern, I expect it will continue to decline. With the higher standard of dancing, though, it’s possible it could go in the other direction. With thanks to Ms. Taz, who dug up the AI season averages, I’ve also created a graph to illustrate one of the points from my first post – that viewers on lots of shows are on a declining trend. Look at the above screen cap from Zap2It for the AI total viewers number….then compare that to the average viewers per season in the graph below. AI was selected because the comparison is obvious; it’s in it’s 11th season and is also a top5 show. First, in case you’re wondering, I only graphed American Idol so that it fell realistically on the chart. That is, since it only airs from January through May, with no fall season, I graphed it so it’s seasons correspond to the Spring season from DWTS the same year. 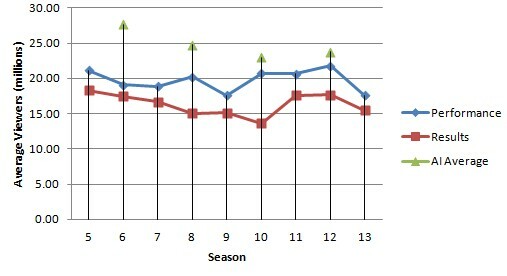 Next, note the distinct downward trend over the season – it’s even more pronounced and steady that DWTS is. DWTS will decline and then rebound; American Idol only rebounded with the new judges, and it was just a slight uptick. Look back at the screen cap up top again – AI has dropped from an average of 23 million in Season 10, to just over 17 million last week. I haven’t done the math, but that seems like a more significant drop than DWTS’s. Now, they aren’t in direct competition with each other as they don’t air against each other. But if you click the link to my previous post and look at The Voice’s numbers…then look at the numbers for the Voice this past week when it was directly against DWTS and you’ll note that it fell by about 5 million viewers. You’ll also note that the presence of DWTS pulled Castle back in to the to 20 programs. 9 responses to "Dancing with the Stars Season 14, Week 1 – Ratings Watch"
I wasn’t ever really worried, because compared to other shows DWTS is still Top 2-3 shows. But hearing these buzzwords from the media gave me quite a “is this a bad sign?? ?” thought. And to people always pounding on the key demo thing, WELL no matter what it has >17 mil viewers each week! Shut up haters, abc won’t cancel this one! Love that you came back to finish making the case on the ratings! Thank you, Mr Spock, er…Miss Heidi. Once again, logic prevails. Calm and steady. I knew you could back up your words with facts. Excellent! Very impressive numbers. I was surprised that The Voice is still up there, I lost interest quickly this season and haven’t tuned back in, maybe I will tune in when they do the live shows??? I don’t know though. Thanks – once you get it set up in excel and you have all the numbers at your finger tips (that’s the hard part) it’s a piece of cake. About the Voice – they start their live shows this week so we might see them rebound a bit. I think it’s all about either seeing if the judges will turn around or having the chance to vote on your favorite – the battle rounds aren’t that exciting. I agree the battle rounds are not exciting. Dwts is fine. It gets what abc wants but if they keep pushing William and Katherine ( look will and kate, lol), I will be off to The Voice and voting for Tony Lucca and watching the Erin Martin train wreck. At this point, Jaleel hopefully comng back, Donald and hilariously fun partnership of Maria and Derek will keep me watching dwts. But it seems inevitable that Will and Kate will be in the finals and the whole personal story week does not work for me. It seems more fitting for contemporary dances than ballroom. I mean, a jive for Melissa? Feel the oh good one will be Katherine who got a great dance for her and sure Mark will go the emmy baiting route.